Mr. Purcell is a native of Tuscaloosa, Alabama and has resided in Eufaula since 1972. After receiving a B.A. in history from the University of Alabama, he attended graduate school in the same field. He was a Captain in the U.S. Army Reserve, 1969-1977. 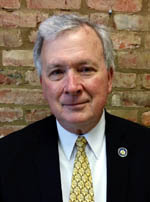 Between 1972 and 2011 he served as executive director of the Historic Chattahoochee Commission, an agency of Alabama and Georgia involved in the promotion of tourism and historic preservation. He is past president of the Alabama Historical Association, Alabama Historical Commission’s Board of Advisors, Alabama Trust for Historic Preservation and the Eufaula Heritage Association. He is also past chairman of the Alabama-Live-In-A-Landmark Council, Main Street Eufaula, Inc., RiverWay South and the Eufaula Historic Preservation Commission. He has served as a member of the Middle/ Lower Chattahoochee River Board of Governors, ACF Stakeholders. During 1989-1998, he served as one of two Alabama advisors to the National Trust for Historic Preservation and was chairman of the Trust’s ten-state Southern Region Board of Advisors from 1997-1998. In addition, he served on the National Trust’s Executive Committee and was Secretary in 1998. He has served several terms on the Marketing Committee of the Alabama Tourism Department. Mr. Purcell currently serves on the boards of the Murals of the Wiregrass, Eufaula- Barbour County Chamber of Commerce, Chattahoochee Indian Heritage Association, Eufaula Heritage Association, Friends of the Alabama Archives, Alabama Historical Association, Barbour County Governors’ Trail Council, North Carolina Scottish Heritage Society and Friends of Fendall Hall. He is a past board member of the Pioneer Museum of Alabama, Historic Westville Advisors, Alabama Center for Traditional Culture Advisors, Alabama Travel Council, Alabama Hospitality Association and the Alabama Environmental Council. He is currently president of the Purcell Family of America Genealogical Association. He is an active member of the Eufaula Rotary Club, having served as president and is a Paul Harris Fellow. He is also a graduate of Leadership Alabama. He and his wife Betsy have two children, two grandsons and a step- granddaughter. Mr. Purcell serves on the Long Range Planning Committee. Previously he served as Chair of the Council’s Long-Range Planning Committee and as a member of the Grants Review Committee.